What is ballistic coefficient (BC)? Without getting into the math, BC is basically a measure of a projectile’s ability to maintain velocity as it flies through the air. It is calculated based on the sectional density (weight of the projectile in relation to its diameter) and form factor or shape of the projectile and is expressed as a number, typically in decimals. The bigger the number the better. This sounds pretty straightforward, but so many factors affect BC that it is generally just an approximation of what the pellet or bullet will really do. We’ll discuss that more below. First, though, you need to understand that pellets have extremely bad BCs, in fact, that is really what makes them pellets! Whereas a bullet is stabilized gyroscopically, or by spin, a pellet is stabilized by the flared skirt at the back. This produces a lot of drag and keeps the pellet’s nose in the front and tail in the back. Like a badminton shuttlecock, this shape is extremely stable, however, also like a shuttlecock, no matter how fast it starts out it slows down very quickly. To give you some numbers, the BCs of most .177 pellets are in the 0.01 – 0.02 range whereas most 22lr bullets are in the 0.10 range (ten times better) and long-range bullets generally range from 0.5 all the way up to 1.0 with the .50 BMG! Generally, the heavier the projectile the better the BC, so most .22 pellets will have a better BC than .177, and most .25 pellets better than .22 and so forth. However, sectional density, the relationship between weight and diameter, means that a very heavy pellet in .177 like an H&N Piledriver or JSB Beast will have a much better BC than a lighter .22 pellet. So, likewise, a 13gr pellet in .177 will have a much better BC than a 13gr pellet in .22, all else being equal. The other factor apart from sectional density (weight) is the shape. 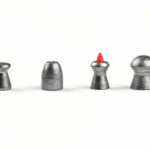 Simply put, the more aerodynamic the shape the better the BC, so domed pellets beat out wadcutters and to a lesser extent hollow points. 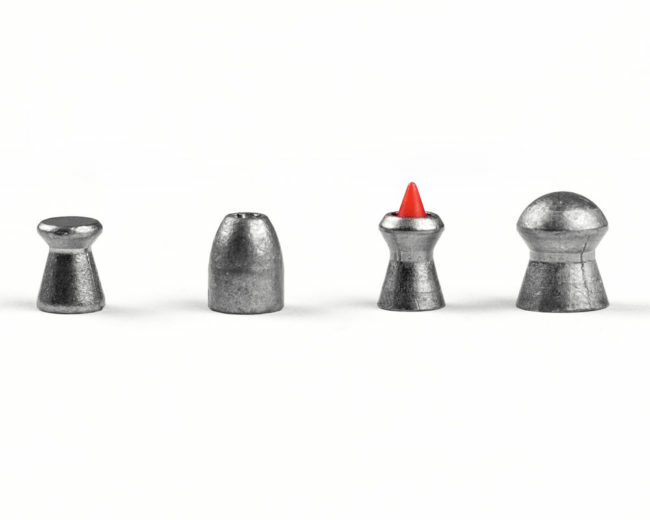 At subsonic velocities, pointed pellets don’t tend to have a better BC than domed pellets and are almost always less accurate so they can be ignored. 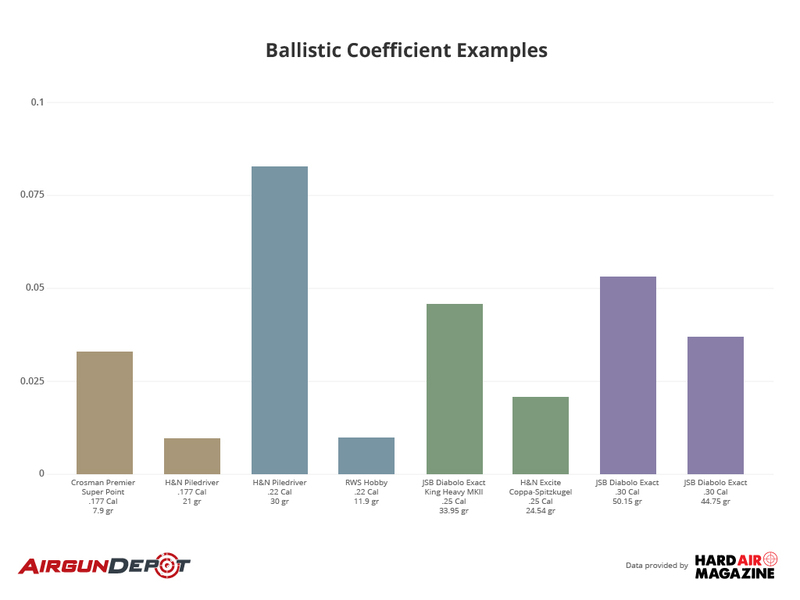 Why should you care about ballistic coefficients? You already know that a pellet follows a trajectory, or in other words, instead of a straight line it has a path that curves downward. Just as you can’t pull a rope so tight it won’t sag, you can’t shoot a pellet so fast that it won’t drop. If you know the BC of the pellet you are shooting you can use programs like Hawke’s Chairgun Pro to calculate the drop at various distances and also determine the terminal velocity and retained energy. Additionally, when we speak of retaining velocity it should be noted that in the technical sense velocity means not only speed but the direction, so BC also describes the ability of a projectile to resist wind deflection, or to “buck the wind.” Even at short ranges, this is a very important consideration for airgunners because pellets are so easily tossed about in the breeze. So it is clear that if you want a pellet for shooting long range you need one with a high ballistic coefficient, but how can you tell what a pellet’s BC is since it isn’t published by the manufacturer like it is for bullets? Well, the first way is to guess. But if you want to get more specific you will need to either consult results published by independent testers like this one by Hard Air Magazine, or you will need to do your own testing. To figure out the BC of your pellet of choice you will need either a chronograph or a Doppler radar and since you are more likely to own a chronograph than a radar that is what we will cover. The basic process is to measure the velocity of the pellet at two distances and then plug the numbers into our ballistics calculator. If you have only one chronograph place it a couple of yards in front of your shooting bench and shoot a number of pellets through it. (If you are using a PCP either tether it or refill to the same pressure frequently so that you get the most consistent results possible.) Take the average of the shots. Now move the chronograph down range and repeat the process. (Don’t shoot the chronograph!) Measure the distance between the two locations and put the distances and the velocities into our ballistic calculator and there you go! If you have two chronographs it is a bit easier. First, make sure they are calibrated by putting them end to end and firing some pellets through them. The velocities shown by the second chronograph should be just a little lower than the first. Then switch the two chronographs around and check that the results are the same. Now the process is the same as with one chronograph, but you don’t need to take the average of a number of shots through the first chronograph and compare it to an average of shots through the second. Instead, plug in the two velocities of each shot. Can bad BC be good? As we saw above, a good BC means that a projectile will have a longer effective range, retaining both power and accuracy at longer distances, but is this always a good thing? While you might think the answer is an obvious yes, the answer is actually a definite no! In fact, one of the real advantages of an airgun over a firearm is that pellets lose their energy very quickly, making them much safer to use in urban environments. This is not to say that you don’t need to be conscious of your backstops or what is behind your target because you sure do, but consider this example: A 7gr Hobby pellet traveling at 800 fps at the muzzle putting out over 10 fpe only retains about 1.5 foot-pounds of energy (for comparison, the Red Ryder BB gun puts out about 1fpe) at 100 yards while a 22lr bullet can retain up to 15fpe at 1000 yards. If you are pesting in your backyard, for instance, or in a barn or a feedlot, the fact that the pellet is going to quickly shed energy is a very good thing. How do you get the best possible BC with your airgun? Shoot slugs! Because of their shape and sectional density, slugs have a much better BC than pellets do, but they also have drawbacks. First, they don’t have a flared backside s they need gyroscopic stabilization and many airguns, especially springers and CO2 guns, don’t have the power to shoot them fast enough to get sufficient spin stabilization to make them accurate. Second, they are more expensive. Third, their better BC makes them less fit for shooting in urban environments. Fourth, most slugs aren’t as accurate as pellets. One last consideration is the fact that a good BC does not mean that the pellet is going to be more accurate"that has to do with a lot of other factors. Now that you have the gist of ballistic coefficient and how to calculate it we’ll add the fine print. As mentioned above, there are many factors that affect BC so that it is never exact. For example, BCs change with velocity, so a listed BC of a bullet or a pellet is only really meaningful if you know at what velocity the projectile was measured. Bullets tend to have a better BC the faster they are going and a worse BC as they begin to slow down, but a pellet’s BC is generally the opposite. A pellet is going to slow down a lot faster in the 1000-800 fps range, and thus have a worse BC than it will in the 600-400 fps range. For example, JSB Beasts in .22 has a BC of 0.038 when measured with a muzzle velocity of 920 fps. This is a great BC for a pellet! However, starting with a muzzle velocity of 790 fps they have a BC of 0.054, which is the best we’ve ever seen! Other factors such as temperature, elevation above sea level, barometric pressure, and even the idiosyncrasies of individual barrels also affect BC, but these are minor enough that we won’t go into them here. One thing that complicates BC calculations is that they are done in relation to a standard model. 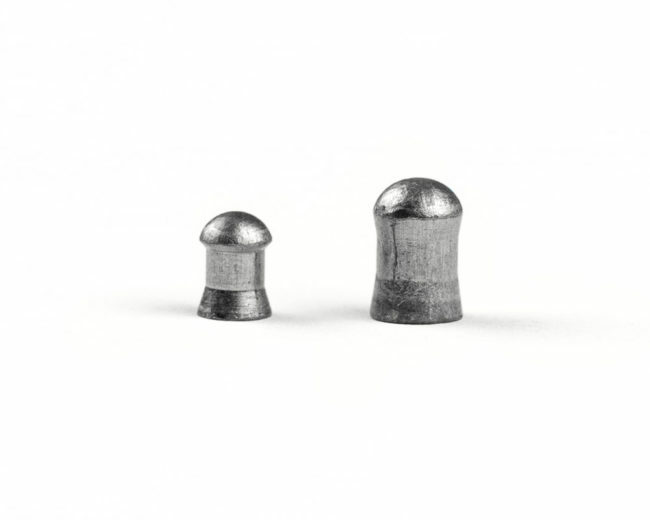 For bullets the two most common standards are the G1 and G7 models, but pellets are so different that they have their own standard, the GA. A ballistic standard such as the G1 or GA is a model of a projectile shape from which the drag and BC can be calculated. The G1 is a model of a short, flat-bottomed bullet, while the G7 is for longer boat-tailed bullets. The GA is a standard domed pellet.